National parks and National Forests are an awesome option if you are lovers of the outdoors and want to make nature an important part of your day. Some national parks require you to get a permit, but they’re typically pretty cheap and if they do have a permit fee its usually $400 or less, way cheaper than a venue! So if you decide to go this rout just make sure you double check with any permits you need to get in advance ;) One thing that is extremely important to prioritize when planning a wedding in a National Park or Forest is Leave No Trace, or basically, leaving a place better than you found it. Also, check out National Forest and BLM lands. The difference between National Parks and National Forests is that Parks are more regulated, you pay entrance fees, and they are more developed with established campgrounds, visitors centers, and rangers. National Forests can be just as beautiful as National Parks, but there are far fewer regulations. They may not be as developed, but there tend to be fewer crowds. Often times they have easily accessible areas around lakes and in meadows, they have large group campgrounds and sometimes amphitheaters. To get an idea of where National Forests are located, when you open google maps, they are the large sections of green, usually around mountain ranges. If you live in Colorado or California, you know that roughly half of your state is National Forest land. 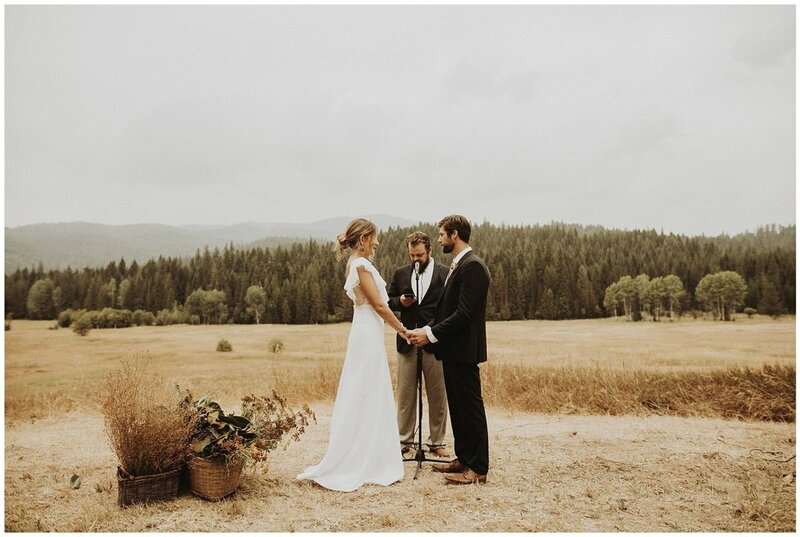 For weddings in National Forests, you do still need a permit. These can vary in price depending on where you're having it, but its typically less than $200. If you're considering getting married in a National Forest, contact the ranger station to see what regulations they have in place. Airbnb or VRBO are also good options if you’re looking to host your guests in the location you’ll get married in! They are way more intimate and comfortable settings than hotel rooms because everyone can feel at home and be together rather than separated by floors and elevators and room card keys. I've been a part of several weddings at people's houses, vacation rentals and sometimes Airbnb's. Typically this is better for smaller weddings & elopements, but I did have one larger wedding that had their reception in the backyard of their vacation rental in upstate New York. If you're having a smaller wedding and you want all of the amenities (umm...bathrooms...) consider looking into vacation rental houses. Talk with the host to see if they allow events/parties and if there are extra fees for it. And check out this list of the most amazing Airbnb's in each state. This can be especially fun for elopements. This way you can make your elopement into your honeymoon too and you don't even have to go anywhere. Check different wedding blogs like The Venue Report, Green Wedding Shoes, Junebug Weddings, Hey Hey Hello May, Rocky Mountain Bride, and local wedding blogs (the list goes on and on) for ideas on location and venue options because they usually have lots of info on the venue/better photos of spaces/setup inspiration options for the venues. Bars, backyards and campsites are some of the funnest weddings I’ve ever shot because they’re such comfortable laid back spaces that everyone can just chill and hang out rather than feel formal. They’re usually a lot cheaper, too! Public lands. There are tons of amazing beautiful outdoor spaces you could use but just make sure you check on usage info and permits and leave no trace behind! Here’s an example of a pop up wedding I shot on public land where they didnt have to get a permit at all, they took a bus out to the spot with everyone and each person carried their own chair. Just remember you can make any space work. A place doesn’t cater? Call your favorite food truck to come cater for everyone (which usually saves lots of $). You need to find chairs for everyone for the ceremony? 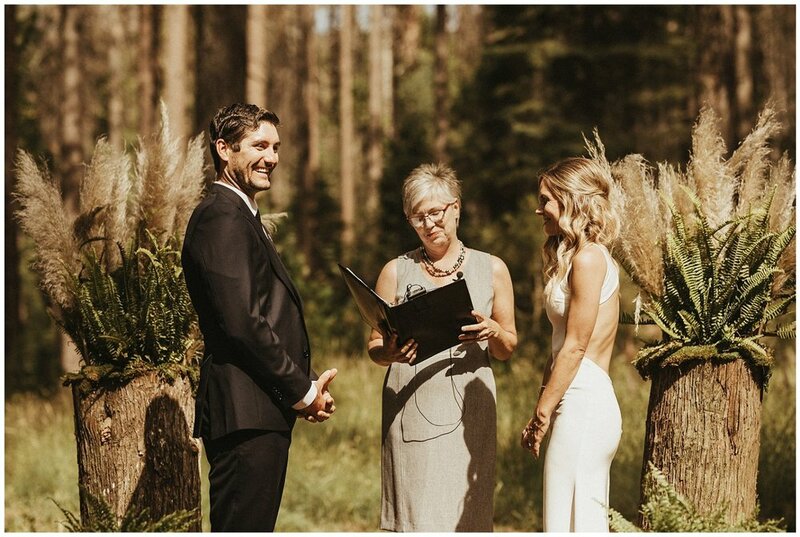 If your ceremony is going to be short and sweet, standing is usually not an issue and you can do more interesting intimate setups with where people stand surrounding you, or you can find a rental company that will deliver and pickup. 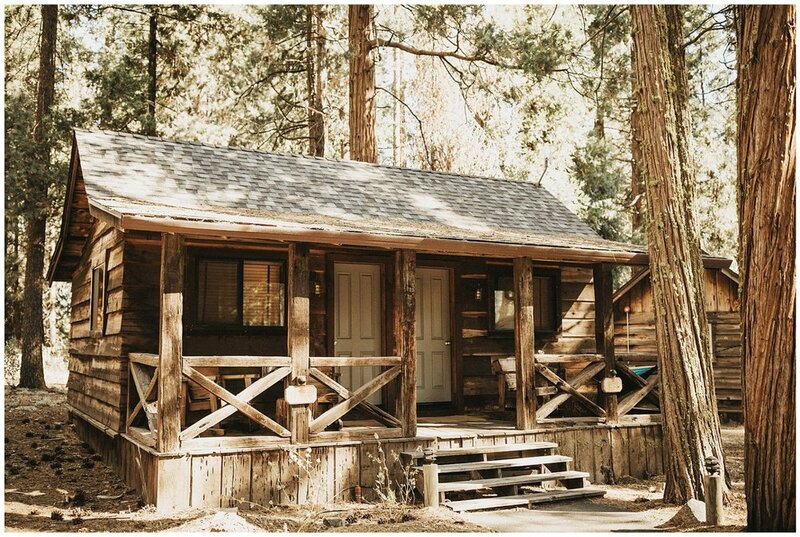 Find a location that can accommodate everyone like a cabin, lodge, campsite or airbnb. This makes everything feel more intimate and you can be surrounded by one another and make more memories rather than being separated! Wedding weekends are an awesome way to spend more time with yoru friends, family, create more memories and a longer wedding experience. I’ve seen weddings that trade out that rehearsal dinner for a beach volleyball party, barbecue, game night, or swimming at a lake followed by burritos and drinks. There's seriously no rules on what you can or cant do. Just do what you love to do with your friends and family! I’ve also seen lots of people do a big brunch with everyone the morning after the wedding followed by a little hike, or laying out at the beach together, bar hopping, a boat ride, or going sledding together with hot cocoa. This just adds to the experience and it's fun to have it all captured so your family can have photos of the candid unposed moments of memories that will last for ever! Remember, this is all about being surrounded by the ones you love and making all the memories. Try not to cram in too many things into a tight schedule, because guess what? There is always something that will go wrong on your wedding day. Thats just how it goes. I haven’t been to one wedding (and I’ve been to a lot!) where everything goes according to plan. Plan for things to take longer than you think for this reason, as well as making sure everyone can feel relaxed and not rushed all day long. A fast paced tight schedule will always result in stress! 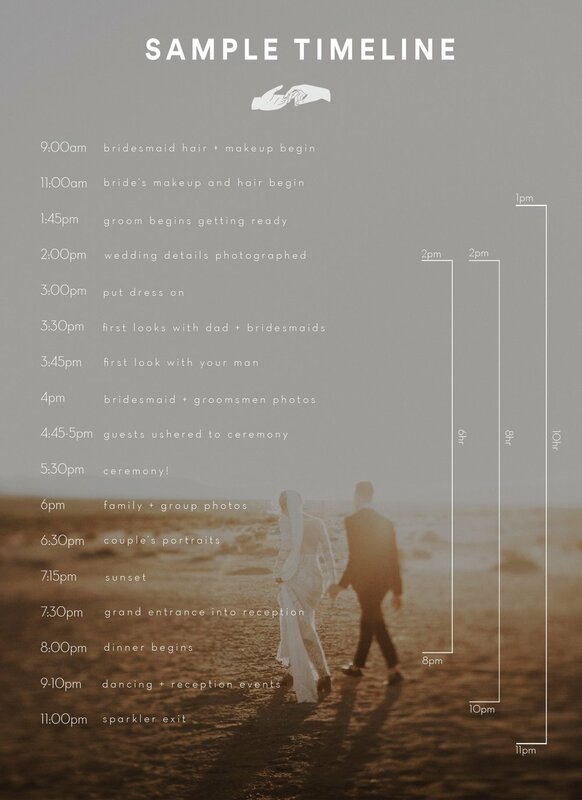 Here is a little sample timeline I’ve put together with timing tips for each part of the day. Don't care about the tradition of not seeing each other on your day until the ceremony? Then spend your morning together. Go on a walk through the woods with your pup, grab coffee at your favorite local cafe, make waffles and eggs together at home in your sweats, snuggle your cats and have brunch in bed, help one another get ready. Do whatever it is that will make you enjoy your day and make it more “you”. Good light. I swear, you will be a master of noticing light by the end of all this, haha! Try and get ready near a window with natural light coming in, it is much prettier for details and your skin than yellow-ish overhead lighting. Like I mentioned before, keep indoor lights off during getting ready photos so you dont get mixed colors in your photos (dont worry, I’ll switch them off if you forget!). Also, bring a pretty hanger for your dress! It can be a simple wooden one, it doesn’t have to be anything fancy, as long as it’s not that ugly plastic one. You know what I'm talking about. Backlight: One of my favorites, It's so great for photos because it creates a very dreamy yummy look, typically in the evening or early morning as the sun is low in the sky. But it can sometimes be distracting for guests if they are facing directly into it (which is fine if they have sunglasses!). If you’re having your ceremony in the evening when the sun will still be shining on your ceremony location, I would highly recommend angling the set up a little bit to the side of where the sun will set so that it is still dreamy for photos and comfortable for guest’s; win, win! If the sun will be low in the sky but light won’t be hitting your ceremony location I would recommend facing your ceremony so that the sun ( or where it should be) is at your guest’s backs! This creates a gorgeous gradient in the sky with lots of pastel colors and is really, really beautiful. Remember that if you’re checking out a ceremony site in the winter, the sun will set in a different location on the horizon/mountain range in the summer, so plan accordingly! You can check exactly where the sun will be in the sky and where it will be shining with the app Sun Seeker on any day of any year, so you can plan around it! Mid-day/overhead light: I would have to say this is the worst lighting for photos, always resulting in both really bright blown out patches and super dark areas this causes the photos to lose a lot of detail like people’s faces, decor, colors, etc. It's also uncomfortable for guests because it's usually the hotest part of the day. Midday light doesn't have a soft dreamy look and makes photos look pretty awful. If you can't avoid a direct sun midday wedding, angle your ceremony so that it will be backlit if possible, this will improve the image quality. If at all possible shoot for the shade or dappled sunlight, I LOVE shooting with a mixture of shade and that bright white midday sun, ceremonies are beautiful midday in the shade speckled with some light leaking through! Shaded or Overcast: One of my absolute favorite lighting scenarios and probably the best case scenario for photos and guest comfort! Shaded or overcast light means there will be even light from start to finish and preserves all details in photos like colors, your dress, and it makes your skin look great! Indoor : natural light coming from a window is ideal for indoor ceremonies, but if you cant use natural light only, make sure the indoor lights are bright so that the photos can have the best quality possible! Although you might feel like you have enough lights, christmas string lights aren’t usually bright enough. I recommend bigger brighter string lights like restaurant patio lights you can buy for $50 at costco! It's totally unnecessary to give me a “photo checklist” because like I’ve said, I’ve shot a ton of weddings and know what I’m doing. Trust me, I’ll get photos of basically everything (and more) that you think is important and that you’ll want to remember, including groupings of families! The only times I need a list of photos to get is if there are extremely small details that I could be oblivious to such as your grandmas pin on your bouquet or your dad’s funny socks you gave him. The only other situation is if you have a certain cousin or friend that flew in or group of high school friends for example that you want a photo with that I wouldn’t know of, I know all the family and friend photo groupings that are important! Also be sure to let me know if there are any tensions, divorces, or deaths in the family I should be aware of so I don’t accidentally create any awkwardness during group photos! Dont want some random pastor marrying you? Have your dad or best friend or sister or whoever get ordained! Follow these steps on how to get anyone ordained to be able to marry the two of you. Being married by someone who is close to you and knows you both and your relationship well will be way more meaningful and emotional and special to the two of you rather than someone that comes in that you pay to say the same crap they say to everyone else. Make it personal! You wanna elope but your family wants a big wedding? Do both. 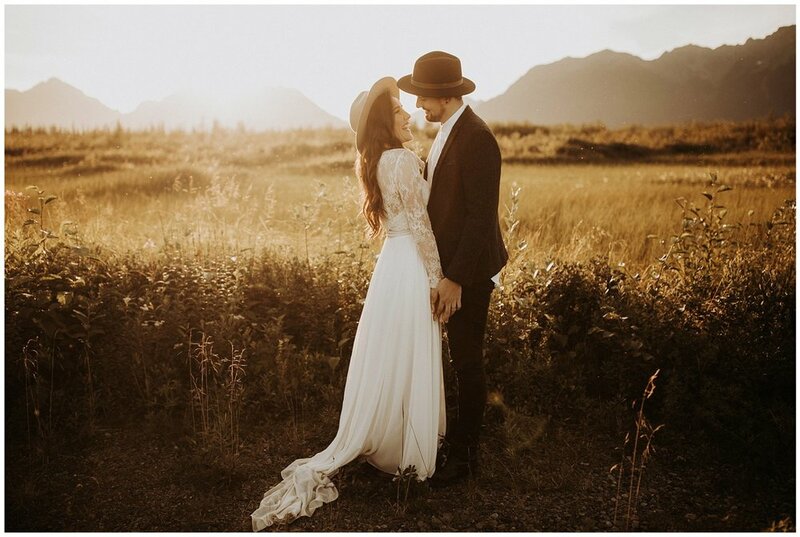 Elope and do your vows in a location that is beautiful and meaningful to you both that you can feel the most connected to each other in, you could even take your 10 closest family members and friends. Then head back home a month later and throw a big party or bbq or bonfire to have all your fave people surrounding you eating tacos and roasting marshmallows and dancing the night away. This way you can get the best of both worlds and have it be no stress! Do you want to do vows but dont want to share them in front of a bunch of people you dont totally know (aka your mom’s cousin or your dad’s high school buddy)? Sneak off after the first look before the ceremony and read your vows to one another privately. This way, it can still be documented and private and emotional while still sharing your ring exchange and “I do’s” with everyone! Feel free to break traditions. Are you not a formal kind of person? Totally fine. Dont follow tradition. Do a buffet style dinner where people can sit wherever the crap they want. Dont like cake but love churros? Have a big pile of churros instead. Don’t want to spend your wedding night shaking hands and hugging random people you’re meeting for the first time? Don’t do a receiving line and float around the reception chatting to the people you actually care about. Don’t want to do bridesmaids and groomsmen? Thats a million percent fine. Don’t want to do your first dance to a slow song? Do it to a fast loud dirty-word-filled reggae song. Traditions are meant to be broken and there’s no reason you should do something on your wedding day just because it’s expected! This is your day. Yeah, it’s important to honor your family members by doing certain things on your day or including them in different things, but just remember this is ultimately your day and you should be doing it for yourselves and making it as meaningful as you possibly can. So often brides will get too caught up in trying to make their mom happy and they realize their wedding is something that is more meaningful only to her parents rather than her. This will be the day you remember for the rest of your life and you should make it as comfortable and fun for you two as much as you can!